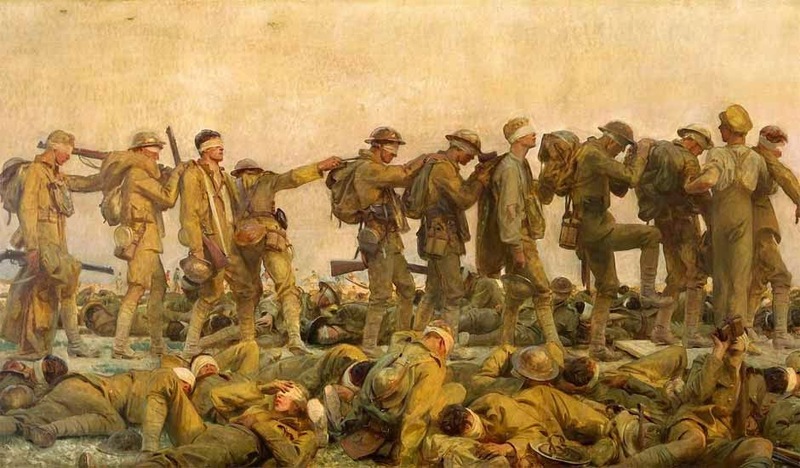 Gassed is a very large oil painting completed in March 1919 by John Singer Sargent. It depicts the aftermath of a mustard gas attack during the First World War, with a line of wounded soldiers walking towards a dressing station. Sargent was commissioned by the British War Memorials Committee to document the war and visited the Western Front in July 1918 spending time with theGuards Division near Arras, and then with the American Expeditionary Forces near Ypres. 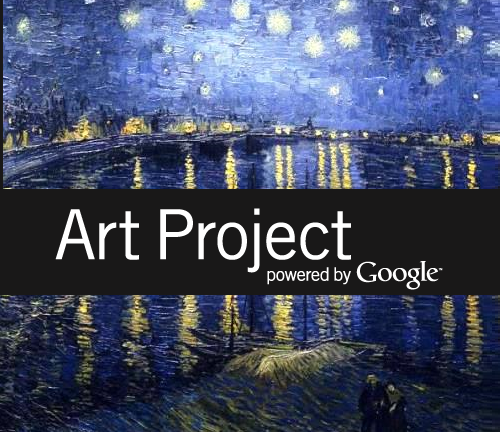 The painting was finished in March 1919 and voted picture of the year by the Royal Academy of Arts in 1919. 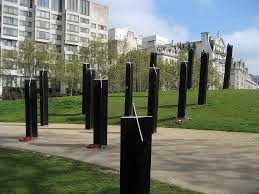 It is now held by the Imperial War Museum. On August 21, 1918, Sargent witnessed ‘...a harrowing sight, a field of gassed and blindfolded men’, near the front line in France, and began to sketch them. These drawings he wrestled into a composition of grand scale and memorial purpose with the structure of a sculptured frieze. The scene is set against a dappled yellow sky; Monet-like, it lowers to pink, and then to blue on the horizon, with a subdued harvest moon rising behind a smaller group of figures to the right. Warm evening light falls from the setting sun behind the spectator’s right shoulder onto the main figures, men blinded by mustard gas. On duckboards they feel their way towards the dressing-station, out of the picture, of which only the guy ropes can be seen, intervals in their progress created by a soldier who turns his back, by the exaggerated raising of his knee by another who has been warned of a step but cannot judge its height, and by a shirt-sleeved orderly. 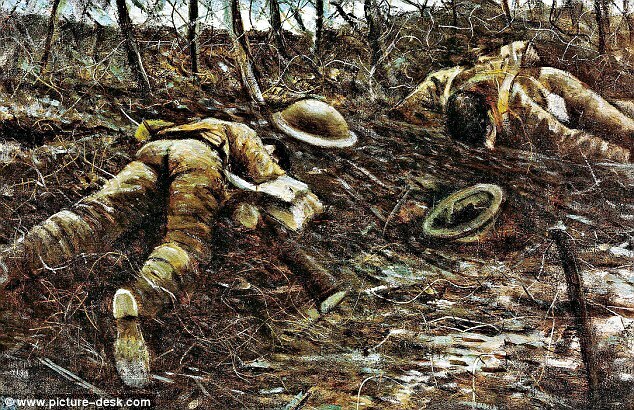 In the foreground more soldiers lie tumbled in the mud, and more still beyond the duckboard – ‘several hundred,’ said Henry Tonks, a fellow war artist. We are so close that we seem to stand among these fallen figures. To the right the sunset light picks out tiny planes engaged in a dogfight; to the left is an empty flat landscape with tents turned pink; and between the figures of the frieze we glimpse jolly footballers in bright jerseys and white shorts, a shrewd, if melancholy, comment on the necessary indifference of soldiers if they are to do their duty. Menin is a place of no importance, but the men of every regiment engaged on the Western Front passed through it, particularly on the march to the Ypres Salient in the Battle of Passchendaele in 1917. Leaving Menin now, the road is marked by an enormous monument. 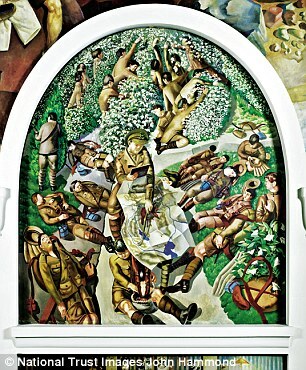 In 1919, the war over, painting in oil on canvas almost for the first time and audaciously working on a far grander scale than was ever possible on the battlefield (six square metres), Nash immortalised for perpetuity a landscape of every soldier’s memory, yet a revelation to all who knew nothing of the ghastly horrors of the Western Front. This great painting has nothing of traditional classical construction; it is not framed by elegant trees in the manner of Claude, Poussin and Cézanne, though it is peopled by them at random intervals, but only by their naked trunks, for every twig and leaf has been blasted from them by the still falling shells. 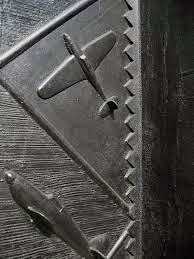 There are no trenches, only shattered defenses where they were, sheets of corrugated iron and shell craters with their drowning deeps of water, thunderclouds again approaching. Two pairs of soldiers, dead centre, lend scale to the perspective. In such a landscape, infinitely extensible to left and right, we can well imagine the summary death and burial of half a million souls. The chapel is a simple red-brick building designed by Spencer (who called it his ‘Holy Box’) and built by the Lionel Pearson, who collaborated with Jagger in the Artillery Memorial. 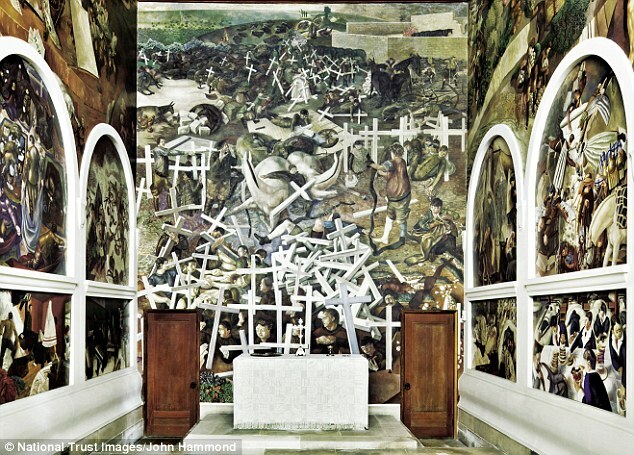 Its interior walls are completely covered with paintings that recall Spencer’s experience of soldiering in the long, bloody and forgotten Macedonian Campaign against a formidable Bulgarian army, allies of the Germans. Recollecting in tranquility, he ignored the battles and the devastation and instead reduced his confrontations with death to the banalities of lice and laundry, ambulances and ablutions, mosquito nets and map-reading, and the barbed wire in which he was once almost mortally entangled, but on the end wall, where the altar stands, he dutifully painted the bodily resurrection of the dead, in which he passionately believed. Inspired by the serried ranks of identical crosses that in their thousands were the outstanding characteristic of the new War Cemeteries, his vision was of bemused soldiers emerging from their graves and either handing their discarded crosses to the diminutive Christ seated in the distance, very near the top in Spencer’s steep perspective, or piling them in a heap behind the altar. 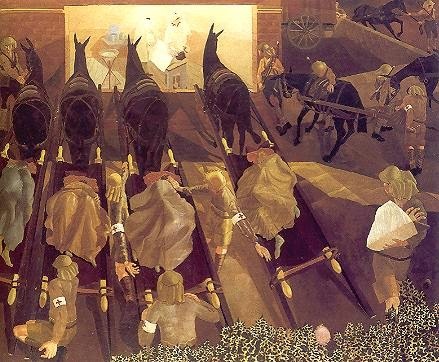 In his simplicity, Spencer included in the resurrection the bodies of the mules on which, in so many theatres of war, the Army had depended, their slaughter appalling in number and cold cruelty. In the representation of a fundamental Judaeo-Christian belief, Spencer’s astonishing act of redemption was without precedent or sequel. 183 cm. x 218.5 cm. Nevinson’s title for this realistic depiction of dead soldiers in a barbed wire entanglement, is taken from Thomas Gray’s Elegy Written in a Country Churchyard – ‘the paths of glory lead but to the grave’. The melancholy romanticism of the 18th-century poet is ironically subverted by the 20th-century painter in the very midst of war by this image of fallen men, gracelessly face down in Flanders mud, left there to putrefy. Unfit to be a soldier, Nevinson had at once volunteered to drive ambulances in France and, by the end of 1914, had seen sights so revolting that while helping as much as he could, he had learned to ‘ignore the shrieks, pus, gangrene and the disemboweled still living,’ as well as the swollen corpses of the dead. In 1917, by then an official war artist, he witnessed something of the four-month-long Passchendaele Campaign in which the German artillery destroyed the local drainage systems and turned the Flanders Plain into a vast quagmire with soldiers drowning in the mud. Distilling his many sketches, he reduced the 260,000 British casualties to the two dead soldiers in Paths of Glory. 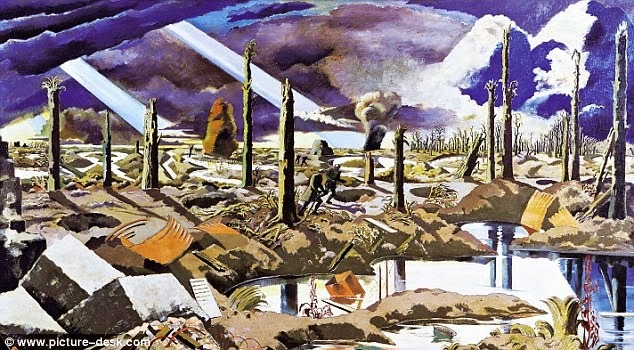 The painting was censored by officials of the War Office who, not wanting the public to be made aware of the brutal realities of war, forbade the reproduction of paintings and photographs of the dead; Nevinson, enraged, exhibited it covered with brown paper on which he wrote CENSORED in bold capitals, causing a sensation. He was right to do so; informed by experience in the trenches, by artillery bombardment, by shell-shocked soldiers so mad that he felt himself infected by their madness, the sophisticated rhetoric of art abandoned, he told a bitter and unlovely truth. 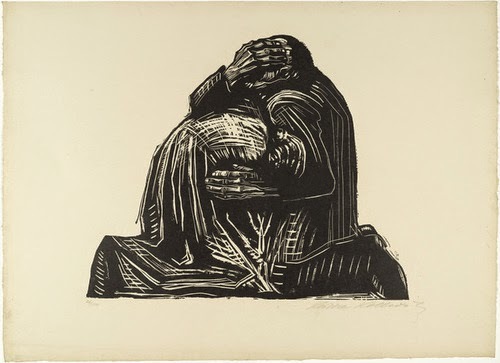 This woodcut shows the sorrow of parents who, like Kollwitz herself, lost a child to World War I. The two figures fuse together into a hulking, solid mass. She noted in her diary, "Pain is completely dark." She reworked this print many times in order to capture the unbearable suffering caused by the war.